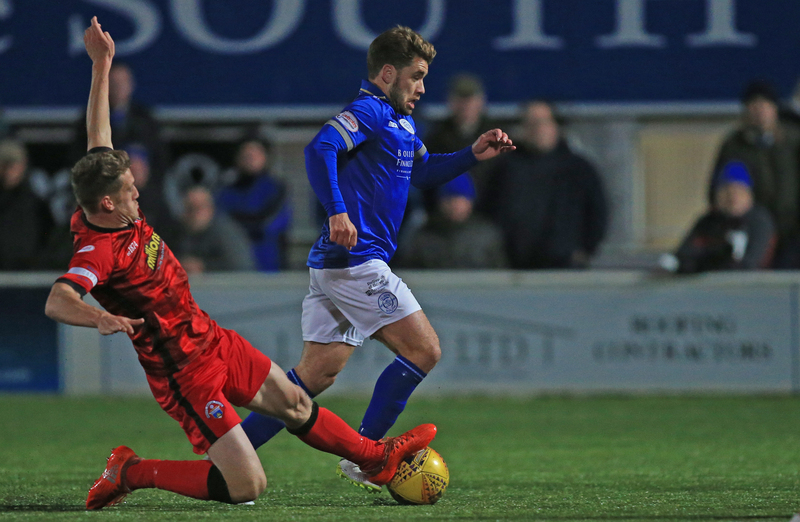 Queens missed the chance to climb into the top three in the Scottish Championship standings after they were disappointingly beaten by Morton in tonight`s clash at Palmerston. After Saturdays win against Falkirk, Queens knew that 3 points from tonight`s encounter would see them move above Dundee United, but it wasn`t to be as visitors Morton bounced back from losing heavily against Ross County to take the points after they produced a disciplined, professional performance topped off by a late wonder goal that frustrated everyone connected with Queens. Once again Queens named an unchanged line-up, but in the early exchanges, they looked slow and ponderous and didn`t really try to take advantage of a team who must have been short on confidence following their weekend performance, and it took 9 minutes before Queens managed to get a sight of goal, but Stephen Dobbie curled a shot well wide of the far post following a neat link up with Lyndon Dykes.A break down the right allowed Andy Stirling to whip in an inviting cross, but there were no takers, and when the clearance fell to David Norman, his attempted shot was blocked into the path of Dobbie but Buchanan cleared before the Queens striker could react. Midway through the half a delightful pass in behind the full-back from Josh Todd released Jordan Marshall down the left, but Marshall`s slight hesitation before crossing allowed Iredale to block the ball away for Queens` first corner which was taken short , but ultimately it came to nothing. Queens next attack ended with Stirling`s right wing cross being a fraction too high for Todd to reach and the ball skimmed off of his head and away for a goal-kick. Although Queens were creating chances they were not really clear cut opportunities, and even when Dykes and Dobbie combined again to set up a chance for Dobbie, he was quickly put under pressure and was only able to send a tame effort straight at `keeper Gaston. For a team that had conceded 5 goals in their last outing - albeit, 5 changes were made to the team - Morton were defending very well, and as Queens continued to try and utilise the aerial ability of Dykes, he found himself well marshalled by the effective Buchanan who barely lost a headed contest all night. The visitors had a chance to create some pressure of their own when they won a free-kick some 30 -yards out, but the opportunity was wasted when Tidser over hit his cross and the ball sailed out of play. Ten minutes before the break and following another corner, Josh Todd should probably have opened the scoring for Queens when he met Norman`s low corner at the near post, but his shot flew over the junction of post and bar. Having been content to soak up any pressure Queens threw at them, for the final period of the half, the visitors began to grow in confidence and on 38 minutes only a timely block by Kyle Jacobs prevented a half volley from McAlister from finding the net. Having survived that scare, Queens were not so lucky on 41 minutes when the visitors made the breakthrough. A long free-kick from half-way reached the Queens penalty area and although Alan Martin started to come for the ball, he changed his mind and was caught out as Buchanan`s header across goal was met by McHugh who had the simple task of heading in from close range. Queens had an immediate chance to draw level when a foul on Stirling on the right wing offered up a set-piece opportunity, and when Norman`s delivery was spilt by Gaston, no Queens player could react quick enough to capitalise on the `keeper`s error. A disappointing half for Queens and despite having the greater spells of possession, and creating the better chances to score, it was the visitors and their fans who were the happier side at the break. The visitors had an early opportunity to double their advantage when a long ball proved difficult for Michael Doyle to deal with, and when the Queens defender lost his footing, Oliver was quick to latch onto the loose ball and move goalwards, but unable to really get full control of the ball he allowed Alan Martin time to get down and block his shot. 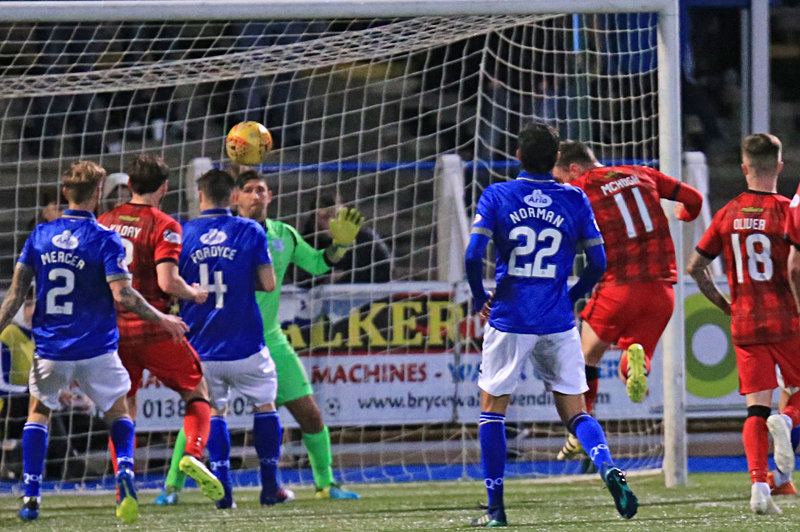 Queens had certainly increased the tempo of the game at the start of the half, and after winning a succession of corners they really should have threatened the visitors more than they did, but a combination of good defending, poor deliveries and missed opportunities kept the scoreline in Morton`s favour. A header from Callum Fordyce, sailed over the bar, and a fine attacking run from Stirling ended with his cross being blazed over by Josh Todd as Queens just could not find the target. Just when it seemed as though it might be one of those nights for Queens, they equalised with a goal out of nowhere. 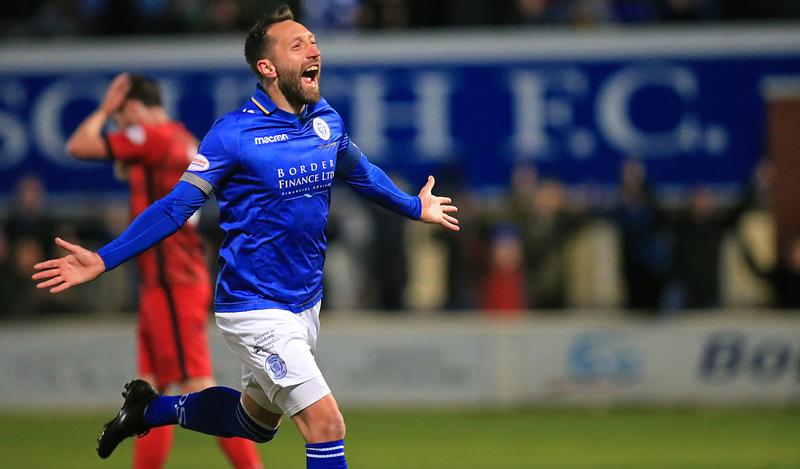 A defensive headed clearance from Buchanan following a corner landed just outside the penalty area where it was seized upon by Stephen Dobbie who drove a low half-volley past Gaston to level the score. By Dobbie`s extremely high standards, he was having a quiet game, but once again he showed fantastic ability to produce a simply stunning finish. Queens were clearly in the driving seat and pushed on looking for a winner, and with his confidence high Dobbie tried his luck again from a 25-yard free-kick left of centre, but he was well wide of the target and is attempt landed in the terracing behind the goal. Further corners - 12 in total - followed as Queens continued to ask all the questions, but the central pairing of Buchanan and Wadell were a match for everything that Queens threw at them. An excellent break down the right from Scott Mercer saw him sprint past two defenders before driving in a low cross that Gaston did very well to hold onto at the near post Then with 6 minutes to go, the away side scored the goal that saw them travel home with all 3 points when youngster Lyon - making his senior debut- produced a stunning finish, by volleying home following a long throw that Queens failed to deal with. 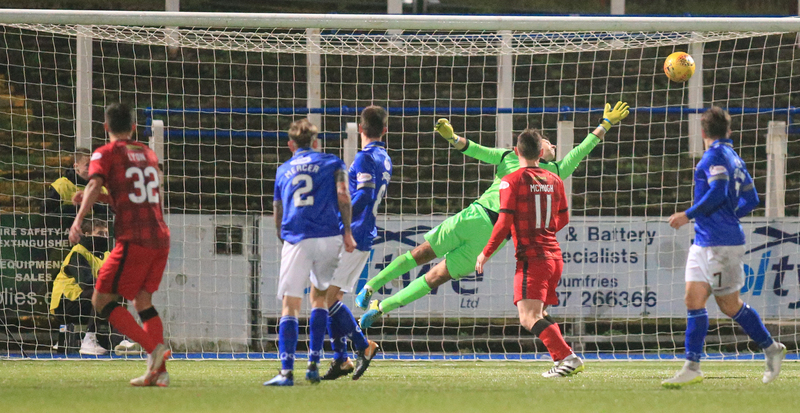 Connor Murray replaced David Norman for the final 3 minutes, and there was one last half chance for Queens to take something from the game, but from a tight angle close in Stephen Dobbie could only direct his shot straight at `keeper Gaston. 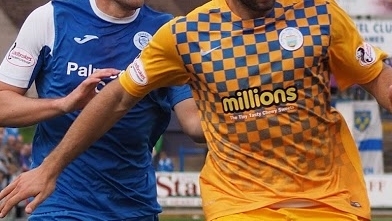 On a disappointing night for Queens, Andy Stirling was chosen as man-of-the-match, but it was Morton and their happy band of travelling fans who would have enjoyed the evening more as the Greenock side left Dumfries with a morale boosting win and in the process joined Queens on 16 points in the Championship table.